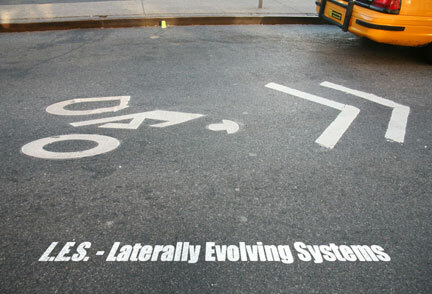 LES – Laterally Evolving Systems: In addition to the contemporary commercial art market, there are also other current systems of thought and distribution for creativity. The Lower East Side has historically been a sight where artists live, work, and dream. What developments are happening at a tangent to traditional art market vectors? Phillia Kim Downs, Jordan Downs, & Jessica Tamson, here collaborate as a trio. They come out of the alternative fashion and music scene currently percolating in the Lower East Side. As is the case with many recent newcomers, the traditional boundaries between different fields and practices are not seen as obstacles to switching back and forth across multiple creative modes. Chris Jordan comes out of the vj and live projection scene, but rather than the psychedelic visuals common in this field, his work relates more to drawing and experimental cinema, and frequently addresses sociopolitical issues surrounding the computer. He has organized a variety of networks around these interests from rooftop film screenings, to projection events, to technology swaps, to salons on the fundamental theoretics of casting light. The social implications of programming and the fundamental mediatic qualities of video, light, and time itself, are featured elements in his work. Paul Olson is part of a matrix of neighborhood people operating with systems only loosely tied to the larger economy, and functioning in the liminal spaces characterized by barter, luck, trust, and a fierce, almost spiritual sense of American individualism. People like Adam Purple who arrived in an economically devastated Lower East Side and began farming in the heart of the city, might characterize this way. Paul Olson constantly documents the world he traverses. The Lower East Side appears as a beautifully lit, smartly propped set for the Underworld in Paul Olson’s photography. Mike Taylor frequently works in the avant garde theater arena, writing, directing, and organizing non-narrative multi media productions involving collaboration as a significant element. She has an impressive depth of knowledge on a phenomenally wide range of subjects, yet her work tends more to provoke questions than to provide answers, leaving the viewer questioning the fundamental frameworks they have learned to “safely” understand the world. You=Love, much like in the world of tag artists, distributes a message across the public urban space of walls and sidewalks, and upon a host of different objects, even including tee shirts. Yet the message is different from the solo cry of powerful existence common in urban art and music. Further, it has almost no commercial component in that her objects get distributed freely. Instead it represents a single minded initiative to disburse, as widely as possible, a simple equation with the message of human equality at its center.